Lacombe, Alberta – For the 8th year in a row, the Gord Bamford Charity Golf Classic is back with the same great mission of providing funds to youth supporting charities across Canada that involve music, education, health care, sports, and multi-use facilities. The Golf Classic’s board and committee members have continued to deliver on that mission year over year, generating over 2 million dollars since the inaugural tournament in 2008. As the main source of funds to the Foundation, the Gord Bamford Foundation is working harder than ever to achieve another record breaking year for deserving charities. This year’s event begins on Wednesday, August 12, 2015 at 5:30pm, at the Sheraton Hotel Exhibition Hall in Red Deer, Alberta. The invitation-only Gala evening will see 750 people come through it’s doors to enjoy an evening of world-class country music, exciting auction items, and the delicious food stylings of the Sheraton Hotel’s chefs. The golf portion of the event hosts a whopping 46 teams, and takes place at the Lacombe Golf and Country Club, Thursday, August 13, 2015. Thanks to the generosity of businesses, supporters, golfers, and sponsors, the Gord Bamford Charity Golf Classic raised a record-setting $503,000 last August, 2014. These funds were proudly distributed to a number of youth-serving charities like Ronald McDonald House Central Alberta, KidSport Alberta, and Make-A-Wish Foundation of Northern Alberta to name a few. Children’s hospital foundations across the country from Calgary and Edmonton, to Winnipeg and Hamilton see benefits from the Charity Golf Classic. “I’m very proud of what this event has achieved over the last 8 years. It’s so great to see many of the same supporters come out each year, as it tells us that people are enjoying our event, and that they believe in the continued support of the Foundation’s deserving causes,” says Bamford. This announcement is hot on the heels of the 6 Canadian Country Music Award nominations Bamford received last week, including the Fan’s Choice Award, where fans can place a vote for their favourite artist at http://ccmafanvote.dmds.com. (Lacombe, AB) Gord Bamford continues to give. Bamford recently donated $50,000.00 dollars to these charitable organizations; Kidsport Canada, Make-A-Wish Foundation (Northern Alberta), Ronald McDonald House Central Alberta, Alberta Music Education Foundation, Boy’s and Girl’s Club of Wetaskiwin, and the Clive Resource Centre. Bamford will be kicking off his Spring tour, by donating an additional $80,000 to children’s hospitals across Canada. Since creating the Gord Bamford Charitable Foundation back in 2008, Bamford has generated approx. $2 million dollars thanks to an annual charity golf classic he hosts in his hometown of Lacombe, Alberta every summer. Those monies have gone to support youth which include or involve music, education, health care, sports, and multi-use facilities across Canada. However, children’s hospitals are also a priority for Bamford, and he’s quick to recognize that music is a form of therapy for children who are ill. “Music has that special power to take a child away from whatever they might be experiencing at that moment in time. I’ve seen it first-hand on my visits to children’s hospitals over the years. I’m so grateful to be in the position to continue to help support such worthwhile organizations and hospitals all across Canada,” says Bamford. One other Canadian hospital is a recipient of Bamford’s generosity; the IWK Health Centre Foundation from Halifax has received a $10,000 for their music therapy program. An official cheque presentation will take place in September in Halifax, NS during Country Music Week which is held from Sept. 10th to Sept. 14th, 2015 respectively. Bamford, is a 19-time Canadian Country Music Association award winner, and two-time Juno Award nominee. He recently won the 2014 Male Artist of the Year, Single of the Year, Country Music Program for Gord Bamford: Christmas in Canada (CMT), Bamford was also honoured to win the Country Music Association’s Global Artist of the Year. His 6th studio album Country Junkie was released on October 8, 2013. More about Bamford can be found at www.gordbamford.com and www.gordbamfordfoundation.com Gord’s raising awareness of the Foundation through social media with the hashtag #GordGives. Be sure to check out Gord on Facebook, Twitter and Instagram. 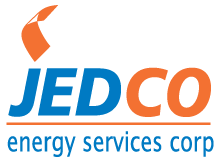 (Red Deer, AB) JEDCO Energy Services and the Gord Bamford Charitable Foundation are teaming up to support Alberta’s McMan Central. The Canadian Country Music Star and Duane Sokalski, Vice President & GM, JEDCO Energy Services, are presenting $6,200 to McMan Central on, October 20, 2014 at 1:00 p.m. at McMan’s offices, located at 103, 5214 47 Avenue in the Park Plaza office building, north of the downtown Co-Op in Red Deer, Alberta. Bamford has supported several central Alberta charities in the past, and Bamford believes through his Foundation, he can affect positive change to others to live their lives in a positive, productive manner. “The Seven Challenges® programprovides a framework for helping youth think through their own decisions about their lives,” says Bamford. “Through the Gord Bamford Foundation, we at JEDCO Energy Services are proud to support the work of McMan Central in offering the Seven Challenges® Drug Counselling program,” says Sokalski. Stewart says the Seven Challenges® Program is fundamentally different from mainstream approaches that engage in what is often called the “mad rush for abstinence.” “With The Seven Challenges® Program we start where youth are “at,” not where we wish they might be and not where they might pretend to be (ready and willing to make honest decisions to change with regard to drugs — and prepared for success in such changes),” she says. Bamford is a 19-time Canadian Country Music Association (CCMA) award winner, a three-time Juno Award nominee, and most recently, winner of the prestigious Global Artist of the Year, presented by Nashville’s Country Music Association. His winning streak continued at the 2014 awards back in September, with Bamford being honoured with the CCMA’s Single of the Year [for the #1 song, When Your Lips Are So Close], Male Artist of the Year, and Country Music Special or Program of the Year for Gord Bamford Christmas in Canada. McMan Youth, Family and Community Services Association is embarking on a new pathway in the hope of continuing service to youth and families. With knowing there are very little services in Alberta for teens who truly want to rid their lives of addiction, it is the hope of McMan is to provide a residential stay program (affliliated with the renowned Seven Challenges program) for up to six months of addiction counselling and treatment. Since 2008 Bamford’s Charitable Foundation has generated over $2 million dollars, and the country artist has made making donations to children’s hospitals a priority. Bamford recently had a record-breaking fundraising night in August, 2014, generating $503,000 at the 7th Annual Gord Bamford Charity Golf Classic. More about Bamford can be found at www.gordbamford.comand at www.gordbamfordfoundation.com. (Calgary, AB) Savannah Hunik has a genetic disorder that affects her joints and makes walking painful; but making music with her music therapy specialists at the Alberta Children’s Hospital (ACH) is a fun way to pass the time as she undergoes her lengthy treatments. Canadian country music superstar Gord Bamford believes in the healing power of music therapy, and through his Gord Bamford Charitable Foundation, the artist gave $10,000 to the ACH’s music therapy program today. Since 2008 Bamford’s Charitable Foundation has generated over $2 million dollars, and the country artist has made making donations to children’s hospitals a priority. Bamford recently had a record-breaking fundraising night in August, 2014, generating $503,000 at this 7th Annual Charity Golf Classic. Marc Houde, Music Therapist in the Music Therapy Program at the Alberta Children’s Hospital says music therapy is known to reduce anxiety and stress related to hospitalization and provides patients and their families a creative means to express their feelings and uplift their moods. This is done through playing instruments, composing songs or simply listening to music chosen specifically for the patient. Justine Clay, Communications Director for the Alberta Children’s Hospital Foundation says they are extremely grateful to the Gord Bamford Charitable Foundation for their continued support of the music therapy program. “This program would not be possible without donor support and we are proud that well-known artists such as Gord Bamford recognize the power that music has in our society, including helping those who are most in need,” she says. Bamford is a 19-time Canadian Country Music Association (CCMA) award winner, a three-time Juno Award nominee, and most recently, winner of the prestigious Global Artist of the Year, presented by Nashville’s Country Music Association. His winning streak continued at the 2014 awards back in September, with Bamford being honoured with the CCMA’s Single of the Year [for the #1 song, When Your Lips Are So Close], Male Artist of the Year, and Country Music Special or Program of the Year for Gord Bamford Christmas in Canada. More about Bamford can be found at www.gordbamford.com and at www.gordbamfordfoundation.com. The Alberta Children’s Hospital Foundation (www.childrenshospital.ab.ca) raises funds for excellence in child health, research and family centered care. As the official fundraising body for the Alberta Children’s Hospital, all money raised by the Alberta Children’s Hospital Foundation is re-invested in the hospital and child health needs in this region. 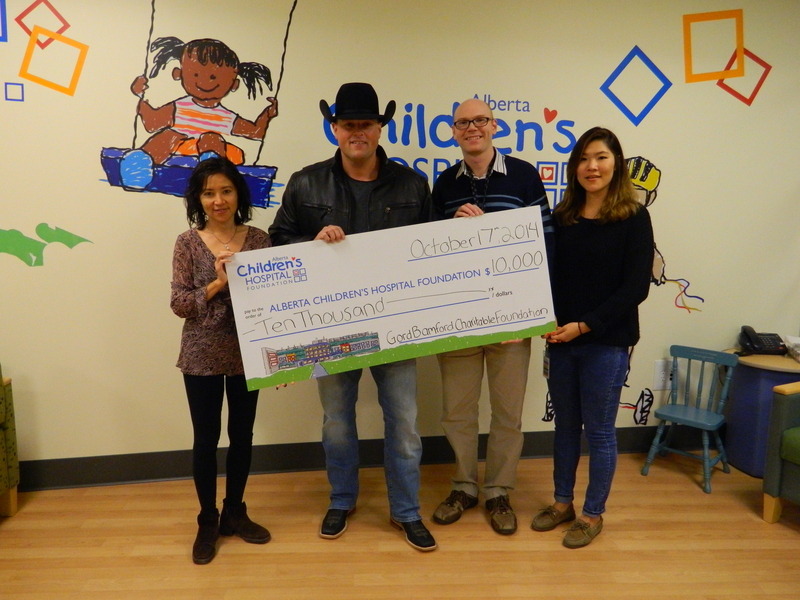 (L-R), Joanna Tong, Alberta Children’s Hospital Foundation, Gord Bamford, music therapist Marc Houde and Alberta Children’s Hospital intern Jessica Ko. (Edmonton, AB) Gord Bamford plans on kicking off his 2014 edition of County Music Week in Edmontonby donating $10,000 to the Stollery Children’s Hospital.The monies are coming from Bamford’s Charitable Foundation, and will go to the Stollery’s Music Therapy Program. The cheque presentation is set for *1:30 p.m., Thursday, September 4, 2014. Bamford’s Charitable Foundation generated a record of $503,000 at its 7th Annual Charity Golf Classic held in central Alberta, August 13 and 14, 2014. Thanks to its success, Bamford says it’s going to make it a lot easier to give back, and one of the reasons why he is using #GordGives on Twitter. “I feel fortunate to have been given a talent to be on stage as an artist; it is my role as a human being to use that stage to also bring awareness to others on how important it is to keep music therapy programs thriving at children’s hospitals. I’m lucky to have seen the positive results that music has with sick children.” Music therapy sessions can be done individually at the child’s bedside or in small groups in children’s rooms or in a common area in the unit. There is also a weekly group session on The Beach, the largest playroom at the Stollery. 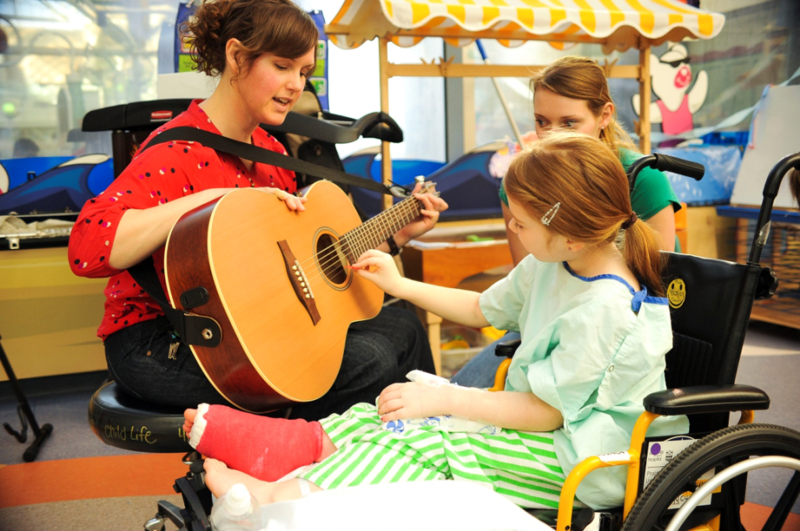 The Music Therapy Program at the Stollery Children’s Hospital began in November of 2011. Gord Bamford was the CCMA’s most decorated artist in 2013, amassing five of seven awards. Last fall he kicked off the launch of his 6th studio album “Country Junkie” with a nation-wide tour with Reba, and earned a 2014 JUNO nomination for Country Album of the Year. The GOLD certified lead single ‘When Your Lips Are So Close’ only took eight weeks to hit #1 on the Country chart in the BDS era, making Bamford only the 7th Canadian artist to reach this milestone. Bamford’s “Christmas in Canada” CD also certified PLATINUM in 2014. Bamford is nominated in seven categories for 2014: CCMA Fans’Choice, Single of the Year, Male Artist of the Year, Songwriter of the Year, Record Producer(s) of theYear, Album Design of the Year, and Country Music Program or Special of the Year for Gord Bamford:Christmas in Canada (CMT). The Stollery Children’s Hospital Foundation is dedicated to enhancing health services for children by raising money to support the Stollery Children’s Hospital and programs that promote health, prevent disease and treat illness and injury. Funding provided by the Foundation supports health services for children through education, research, special services and acquisition of equipment.Bamford’s complete biography can be found on his website at www.gordbamford.com. All Media are asked to gather at 1:20 p.m. at the main entrance of the Walter Mackenzie Centre located on the east side of the building, 8440 112 St., where they will be escorted to the presentation. Music therapist is Elizabeth Stolte works with a patient during her “Music on The Beach” program at Edmonton’s Stollery Children’s Hospital. Canadian country superstar and Sony Music Canada recording artist Gord Bamford generated an official record-setting $503,000 at the 7th Annual Gord Bamford Charity Golf Classic in Alberta, Canada, August 13 and 14, 2014. The Gala took place at the Red Deer Sheraton Exhibition Hall near Bamford’s hometown of Lacombe, Alberta, and featured Canadian rock icons Trooper, Warner Music Nashville artist Cowboy Troy, and Nashville songwriters Byron Hill, Phil O’Donnell, and Buddy Owens. Canadian country music artists Beverley Mahood, Jason Blaine and Aaron Pritchett each sang their current single, along with their favourite rock song. “August is one of my favorite times of year. We’ll be able to do so much more giving as a result of this record-setting event. I’m grateful for those friends and artists who came out to support the Gord Bamford Charitable Foundation, and I can’t wait to start giving back,” said Bamford. Canadian women’s hockey team 2014 Gold medalists and current “Amazing Race Canada” participants Natalie Spooner & Meagan Mikkelson joined their gold medal winning teammates Shannon Szabados and Rebecca Johnston, at the annual event. Canadian Women’s Curling team gold medalists Kaitlyn Lawes and Jill Officer attended the event with NHL Hockey players Curtis Glencross and Matt Fraser, NHL alumni Theoren Fleury and Gilbert Dionne. Past Canadian and World Champion Rodeo Cowboys Davey Shields Jr. and brothers Rod & Denny Hay also attended. The 750 people attending the sold-out event had their choice of nearly 70 auction items that included a signed Keith Urban Gibson Les Paul electric guitar, a Takamine acoustic signed by Blake Shelton, a Buddy Owens original painting of Robert Duvall and a Gord Bamford Private House Concert. The celebrities, as well as Canadian Olympian gold medalists and NHL hockey players were auctioned to golf with guests and sponsors of the 7th annual event. The event generates monies for the The Gord Bamford Charitable Foundation. The 16-time Canadian Country Music Award-winning country music artist started the Foundation in 2008, and now to date has generated nearly $2 million, giving to charities such as children’s hospitals all across Canada, The Make a Wish Foundation, Ronald McDonald House and Big Brothers and Big Sisters. His most recent donation was made during the JUNO Awards in March 2014, when his latest release, ‘Country Junkie’, was up for Best Country Album of the Year. At that time he committed another $100,000 to the MusiCounts Canada program which funds music programs in Canadian schools. Bamford attributes much of the event’s success is due to the strong community-based support. Alberta-based businesses JEDCO Energy Services and Waschuk Pipeline Construction served as the event’s title sponsors, and Dow Chemical Canada as the venue sponsor. “It’s overwhelming to think of what kind of difference The Gord Bamford Charitable Foundation will be able to make because of our success, and I know our sponsors all feel the same way. I’m truly humbled,” says Bamford. More information is available at www.gordbamford.com, www.gordbamfordfoundation.com or follow Bamford on Twitter @gordbamford. 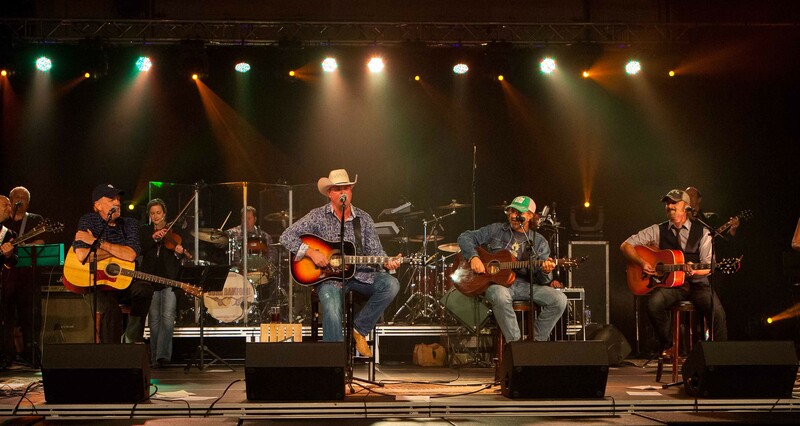 The successful event featured a songwriters’ round of (from L-R), Byron Hill, Gord Bamford, Phil O’Donnell and Buddy Owens, at the 7th Annual Gord Bamford Charity Golf Classic Gala, held in Red Deer, AB, Wednesday, August 13, 2014. ATB Business & Agriculture Services McCaws Drilling & Blasting Ltd.
Downton’s Transport Scollard Energy Inc.
From a Salmon fishing trip to British Columbia’s Queen Charlotte Islands, to a rock star weekend at the 2015 Alice Cooper Rock & Roll Golf Classic in Phoenix, Arizona, the items up for sale offer something for everyone at the 7th Annual Gord Bamford Charity Golf Classic. The private event will host over 700 individuals at the Red Deer, Alberta Sheraton Hotel Exhibition Hall, starting at 4:30 p.m. on Wednesday, August 13. The Gord Bamford Charity Golf Classic is held the next day with a 9 a.m. shotgun start at the Lacombe, Golf and Country Club, in Bamford’s hometown. Celebrities are also auctioned off to the golf teams and companies who have sponsored the 7th annual event, so they will golf with them the next day. It makes for interesting stories. Bamford says his wife went for a higher bid than he did last year. One unique auction item has connections to George Strait. The Gord Bamford Charitable Foundation has commissioned Christine Rea of Sacramento, California, otherwise known as the Guitarstraplady, to design a custom-hand beaded guitar strap. To date, she has made Strait three custom-designed, hand-made straps that are each comprised of almost 20,000 Czechoslovakian seed beads. Other live auction items include an Alice Cooper/Motley Crue VIP concert experience in Edmonton, two seats to a Montreal Canadiens Game at the Bell Centre in Montreal, Quebec with Gilbert Dionne. There are also local experiences, such as a Rebels Night Out Package for 10 people in the Mooney Sky Suite at the ENMAX Centrium Arena in Red Deer, Alberta. The dollars generated at the Annual Gord Bamford Charity Golf Classic go directly to the Gord Bamford Foundation to support organizations that make a difference in the lives of underprivileged youth and multiuse facilities all across Canada. The official 7th Annual Gord Bamford Charity Golf Classic begins at 4:30 pm Wednesday, August 13, at the Sheraton Hotel Exhibition Hall in Red Deer, Alberta and features special guest performer Trooper and Cowboy Troy, and Canadian country artists Jason Blaine, Beverley Mahood, Aaron Pritchett and Duane Steele. The event concludes with the golf event at the Lacombe Golf and Country Club on Thursday, August 14, 2014 in Lacombe, Alberta. Gord Bamford loves giving back. Luckily he’s able to do it easily through his Gord Bamford Foundation which he funds through his Annual Charity Golf Classic. While Bamford’s annual Gala and Golf is a private event, he wants to encourage his fans and supporters Canada-wide the importance of giving back; he’s raising awareness of the Gord Bamford Charitable Foundation through theTwitter Hashtag #GordGives. “The Alberta business community and our 2014 Title sponsors Waschuk PipeLine, JEDCO Energy Services, and Venue sponsor Dow Chemical Canada are great examples of our major corporate support. It was because of their belief in those charities we are helping, that we created the #GordGives hashtag. We’ve built the Gord Bamford Foundation from the ground up, and we wanted to get all Canadians thinking about how they too can help others in need,” says Bamford. One organization that was the beneficiary of a $10,000 donation from Bamford (Bamford donated $10,000 to 10 different children’s hospitals nation-wide) was Children’s Health Foundation of Vancouver Island and its – Jeneece Place –a temporary home where families can stay together when their childneeds medical services in Victoria, British Columbia. The cost of supporting one family with a private and comfortable bedroom, shared kitchen, dining and recreation spaces, and a caring and supportive staff team, is $113 each night. Bamford’s donation covered the cost of 88 nights for families whose children are facing medical challenges. “It was so awesome to have Gord come and visit Jeneece Place. It means a lot to me when people understand how important it is for sick kids to have their family close by when they are in the hospital. I had fun showing him around and it was so cool when he sang for us in the living room. Gifts like Gord’s inspire me to keep working on raising money to support families in my community,” said Jeneece Edroff, Order of British Columbia. Canada’s Make a Wish Foundation, Ronald McDonald House, Big Brothers and Big Sisters, and various children’s hospitals all across Canada have all been beneficiaries of The Gord Bamford Charitable Foundation in recent years. In March, 2014, Bamford committed another $100,000 to the MusiCounts Canada program, to help fund music programs in Canadian schools. The official 7th Annual Gord Bamford Charity Golf Classic begins at 4:30 pm Wednesday, August 13, at the Sheraton Hotel Exhibition Hall in Red Deer, Alberta, and continues with the golf eventat the Lacombe Golf and Country Club on Thursday, August 14, 2014 in Lacombe, Alberta. 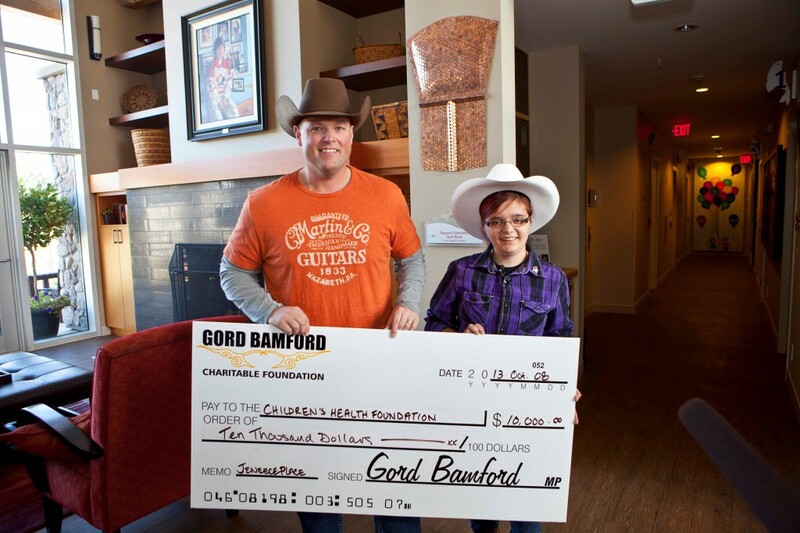 Gord Bamford presented a $10,000 Cheque to Jeneece Edroff in October, 2013. The monies which Bamford raised through his Gord Bamford Charitable Foundation, will assist with funding at Jeneece Place, a temporary home where families can stay together when their childneeds medical services in Victoria, British Columbia. Three Alberta-based businesses JEDCO Energy Services, Waschuk Pipeline Construction and Dow Canada have all stepped up to offer their financial support of the 7th Annual Gord Bamford Charity Golf Classic. And for the first time in the event’s history two companies—JEDCO Energy Services and Waschuk Pipeline Construction Ltd.—are sharing the title sponsorship. “JEDCO’S charitable mission is to improve the quality of life in the communities where we live and work by supporting an organization like the GB Charity Classic, that addresses vital needs and issues in the areas of human services. We are honored to support Gord and his efforts through this event,” says Duane Sokalski, Vice President& GM, JEDCO Energy Services. 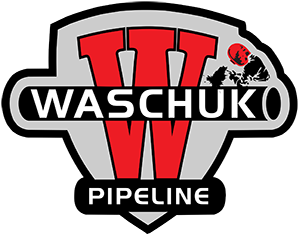 Wes Waschuk, president of Waschuk Pipeline agrees: “Becoming involved with the Gord Bamford Foundation is very important to Waschuk Pipelines, as we both have the same goal: to give back some of our success to those who need it.” This is the third year for Dow Canada to participate as the venue sponsor. “Dow’s corporate citizenship program illustrates our commitment through preserving and investing in our communities. Collaboration is a cornerstone of Dow’s outreach approach and by partnering with the Gord Bamford Charitable Foundation it allows us to make a valuable impact on the nonprofit organizations in our community,” says Shawna Bruce, Public Affairs Manager for Dow Chemical Canada. Also new for this year is the addition of CTV Edmonton’s support, coming on board as the event’s television sponsor. “I’ve watched Gord give away guitars to kids during his concerts and as someone who has spent his whole life with a guitar within reach, I applaud this initiative that creates opportunities for others to enjoy the gifts that only music can bring,” says Lloyd Lewis, Vice President and General Manager of CTV Edmonton. Bamford acknowledges that the Gord Bamford Charity Golf Classic is successful because of the support from these key businesses. “I can’t thank them enough for their kindness and generosity towards this event, that only keeps getting bigger and better each year. I applaud their willingness to give back,” says Bamford. This year’s installment begins on Wednesday, August 13, at 4:30 pm, at the Sheraton Hotel Exhibition Hall in Red Deer, Alberta. The invitation-only Gala evening hosts over 750 people. The golf event hosts 42 teams, and takes place at the Lacombe Golf and Country Club Thursday, August 14, 2014. Ashley Gelmici-McTavish Real Estate McCaws Drilling & Blasting Ltd.
D.J. Will Holdings Limited Scollard Energy Inc. Legendary Canadian rock band Trooper is ready to rock the 7th Annual Gord Bamford Charity Golf Classic Gala held in Red Deer on August 13, 2014. The Juno-award winning rock band’s 10 studio albums have earned multiple gold and platinum awards and their 6 X Platinum greatest hits, Hot Shots, continues to be one of Universal Music Canada’s best-selling catalog CDs and one of the country’s most enduring party soundtracks. Cowboy Troy, one of the original members of Nashville’s Muzik Mafia and familiar face performing over the years with the group Big & Rich, is also ready to head to central Alberta. “I’m really excited about the opportunity to assist Gord with his charitable endeavors. He’s a great guy and his willingness to help others, through his Foundation, makes the rest of us want to jump in and lend a hand,” says Cowboy Troy. Other confirmed celebrities for the invitation-only Gala event include Nashville songwriters Byron Hill, Phil O’Donnell, and Buddy Owens, as well as Canadian country artists Jason Blaine, Beverley Mahood, Aaron Pritchett and Duane Steele. Along with Bamford, the group of artists will perform two songs for the Gala attendees—one song that shows they are both a little bit country & a little bit rock ‘n roll. A number of Olympians will also be attending the Gala and Golf. They include: Canadian women’s hockey team 2014 Gold medalists and current “Amazing Race Canada” participants Natalie Spooner & Meaghan Mikkelson along with their gold medal winning teammate Shannon Szabados and Rebecca Johnston, gold medalist, 2010 Canadian Women’s Olympic Hockey Team. Also joining us from anotherfamiliar sheet of ice are Kaitlyn Lawes and Jill Officer, the 2014 Canadian Women’s Curling team gold medalists. Also attending the event will be NHL Hockey players Curtis Glencross and Kris Russell, as well as NHL alumni Theoren Fleury. Past Canadian and World Champion Rodeo Cowboys Davey Shields Jr. and brothers Rod & Denny Hay have also confirmed their attendance. Over $355,000 was generated on August 6, 2013 thanks to the generous businesses and supporters of the Gord Bamford Charity Golf Classic. The dollars generated at this event support organizations that make a difference in the lives of underprivileged youth and multi-use facilities all across Canada and include groups such as the Make a Wish Foundation, Ronald McDonald House and Big Brothers and Big Sisters. Last fall Bamford donated $100,000 ($10,000 each) to 10 different Children’s Hospitals across Canada, and made another $100,000 commitment to the MusiCounts Canada program, to help fund music programs in Canadian schools. The official Hashtag for the 2014 Gord Bamford Charity Golf Classic: #GordGives.